There's an inherent trade-off when designing a phone, between pure power and respectable battery life. Fortunately, Samsung's latest memory chips are so efficient that they could make 4GB of RAM in phones an industry standard—and make 4K phones a very real thing indeed. The company's first 1GB low-power DDR4 memory chip uses a higher bandwidth than its predecessors, running at 3.1Gbps to provide a 50 percent speed boost over existing DDR3-based chips. Not only that, but the new chips use 40 percent less power, too. Squeezing 1GB onto a single die, four of the chips layered together should provide the highest capacity mobile phone RAM currently available. 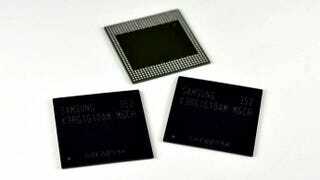 Samsung only says that the new memory will go into mass production some time in 2014, but it's intended for use in ultrabooks, tablets and high-end smartphones. Indeed, Samsung goes as far as explaining that "with the new chip, [we] will focus on the premium mobile market including large screen UHD smartphones... that offer four times the resolution of full-HD imaging." Yep, that's 4K smartphones.